FOR many years, Shelley Argent was PFLAG Australia’s national spokesperson, a high-profile position that took her deep into the halls of power where her determined commitment to equality was devastatingly administered to those who thought her son James was a second-class citizen. 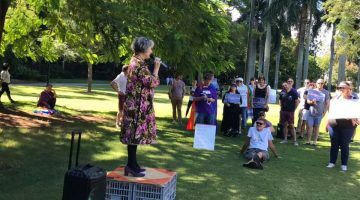 Since stepping down from the role, the worldwide head of PFLAG, former Queensland Premier Anna Bligh and some of Australia’s leading human rights voices and politicians have reflected on the “housewife” from a leafy Brisbane suburb. Adjectives like “brave”, “charming”, “incredibly well-researched”, “intelligent”, “dogged” and “pioneering” have been used to describe her. Combined, it suggests that Argent is a historic figure in the making – if not already. When the Star Observer recently caught up with her, she was early for the Parents and Friends of Lesbians and Gays Brisbane annual general meeting. She was just like anyone’s mum or grandma and made some coffees in polystyrene cups. It is an image that she plays on, and one that is her trojan horse to gain access to the powerful. In looking back at how things were different from when she first joined PFLAG Brisbane 15 years ago and helped it grow immensely, Argent spoke from the point of view of her son’s rights. “When James came out in ‘95, the only rights he in Queensland was the right to be gay,” she reflected. “Now he has the right to be a father, economic equality, superannuation and more protections from being discriminated against at work and by our governments. “I would have liked to see marriage equality through until the end but I simply cannot,” she lamented, alluding to the impact and intensity years of campaigning has had on her. 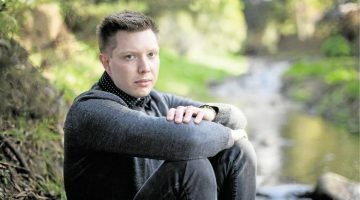 “PFLAG is about supporting parents and one thing I have noticed over the years is that now parents are not ashamed if they come to us with a gay son or lesbian daughter,” she added, also highlighting there was still a way to go for the trans* community. Argent was also blunt in that while seeking tolerance, there was a need to conform. “I could not have done all the things I got to if I looked like an activist. Even if a man was in the room, politicians would want to talk to him first and I was ignored. I realised I had to do this as a mum and to look like a mum,” she said. “But I am a housewife… okay, you could call me a smiling assassin housewife,” she added, bursting into laughter. Argent was awarded Senior Queenslander of the Year in 2011 and is one of the country’s most effective LGBTI rights campaigners. She has even been compared with PFLAG’s worldwide founder, the late Jeanne Manford, by Jody Huckaby – the current executive director of PFLAG National in the USA, the group that Manfred founded. In a rare comment about how PFLAG runs in other countries as they are all technically independent, Huckaby made an exception to acknowledge Argent’s contribution upon learning she had to slow down after an autoimmune disease hospitalised her earlier this year, which forced her into semi-retirement. “Shelley pioneered the parent and family voice in Australia,” he said. “I remember the housewife in the kitchen Public Service Announcement she did some years ago. It was simple but emphatic, it harnessed the power of the parent voice and rallied an entire nation to recognise that the work for equality had benefits for everyone and that all should become involved.” Huckaby also spoke about the real talents of the powerhouse Argent has been in the PFLAG and LGBTI rights movements. “Shelley’s infectious charm, her in-depth knowledge of legislative initiatives, and the powerful networks she built made her an ideal spokesperson for PFLAG Australia,” he said. “She has been living the vision that PFLAG National’s founder, Jeanne Manford, had over 40 years ago: that the power of one voice, one person, one story can change the world. Shelley’s voice has made a huge difference. Despite currently undergoing aggressive cancer treatment, former Queensland Premier Anna Bligh found time to tell the Star Observer that she was “honoured” to be able to add her voice. “Shelley Argent has been a powerful force for good in our community. She brought to her quest for equality and human rights huge courage, many skills and tireless hours of hard work. Australian Greens leader Christine Milne spoke of her affinity with Argent, as she was also a mother of a gay son, and expressed her “thanks and admiration” to the former PFLAG boss. “Shelley Argent has been a tireless advocate for equality and acceptance for the LGBTQI community,” she said. In early 2012, Argent turned her attention to some gaps in Medicare that were hurting the trans* community. At the time, the Star Observer contacted the federal health department for comment. (The spokesperson said: “Shelley Argent is now campaigning for this? Oh dear”.) Her campaign resulted in significant reforms being made just before the 2013 election. More recently, Argent has used her talent and profile to work with Australian Marriage Equality, and national director Rodney Croome was not yet ready to accept that she was pulling back. Croome also thought her everyday-mum image played a role in her success. “Her butter-wouldn’t-melt appearance belies her skill as a strategist, her unerring intuition and her brave heart. She slays homophobia with a smile,” he said. AME chairman and Sydney state independent MP Alex Greenwich also worked closely with Argent at a pivotal time for the marriage equality movement. “Her hard work over many years, including hundreds of painful hours in federal parliament, has made Australia a safer and better place for the LGBTI community,” he said. Labor Senator Doug Cameron was acknowledged by Argent as being a “good man”, and he in return was also a fan, highlighting her understanding of the complex political environment that made her a powerful force. “Shelley was the right person, in the right time, in the right place for the marriage equality movement,” he said. Liberal Senator Sue Boyce, who is part of a cross party group trying to achieve marriage equality, said Argent “was a clever, compassionate mum” and that she was “highly effective” in lobbying for equality. Despite all the praise from several leading figures, Argent was humble. She spoke of her love for her husband and her family and thanked them for helping her become an effective campaigner. “I could not have done this without my husband Don, he has been the best husband and has also financed it incredibly,” she said. And in a rare candid moment, when asked whether soft diplomacy worked when dealing with a homophobic or transphobic government in power, Argent rolled her eyes.